BJ OR wrote: Let's hope he isn't wearing that stupid mask when he hops in. Now I'm gonna have nightmares. Me too. P.U. I can just that sweat.ugh. Does not look like the kind of mask that can be washed. Burned is more likely. He is so gross. Such a perv. In my opinion. Wrapitup wrote: Jeanne, you kill me sometimes. diners, etc. I dont think I would call my own press conferences to give timelines and information about persons of interest especially if LE was investigating these people. What is her motive in all of this? She is taking some heat regarding her daughter being missing and Im sure she is feeling guilty about her neglect and wrong judgement about letting SA into her home but a press conference which bascially is all about her and not about Hailey at all is self-serving. She is taking some heat regarding her daughter being missing and Im sure she is feeling guilty about her neglect and wrong judgement about letting SA into her home but a press conference which bascially is all about her and not about Hailey at all is self-serving. I would imagine she cannot sleep at night, suspecting Hailey is gone forever, all because she made such a horribly choice in bringing such a man into her home. Just listened to BD speaking. IMO she should have not done this. She slammed CD and LE. It appears she is attempting to get the heat off SA. I would like to tell BD, "Clint is actually out searching for Hailey. AND he shows emotion." That is two things BD doesn't do. The mother of missing Colorado City teen Hailey Dunn addressed the media today to "set the record straight." Billie Dunn read a 15-minute long prepared statement to the media. She is holding out hope that Hailey will be found alive and asked her to "come home" and asked anyone who had her to "please let her go." Billie feels that authorities are no closer to finding her daughter, who went missing December 27th. She constructed her own timeline of events from December 26th to the 28th. She also is frustrated with police. She feels they are disregarding witnesses and is confused why they haven't named other suspects besides her former live-in boyfriend, Shawn Adkins. She took one question from KTXS News, which was what was the status of her relationship with Shawn Adkins. She said they are "now friendly." Shawn sure has a hold on Billie. Wonder what she thought was so damn great about him.....and still does? At a news conference Monday afternoon, the mother of missing 13-year-old Hailey Dunn presented her own timeline regarding her daughter's disappearance. Billie Dunn handed out a timeline to reporters saying she had information that investigators had not previously revealed. Dunn claims someone saw her daughter the evening of her reported disappearance on Monday, December 27. At last word, authorities stated Shawn Adkins, Billie Dunn's boyfriend, was the last person to see Hailey. That alleged sighting occurred in the afternoon. Dunn went on to say she was "very disappointed" with law enforcement for not naming other persons of interest in the case. Law enforcement has said they're looking at several persons of interest but have not named them. The only person they've identified as a suspect is Adkins. After saying that they hadn't spoke for some time, Billie Dunn now says she's in regular contact with Adkins. She described their current relationship as "friendly." Dunn also took issue with a few of the points released in police affidavits. She said the notion that she hosted a New Year's Eve party following Hailey's disappearance is ridiculous. Dunn also said she stopped at an ATM in Scurry County on the evening of December 27 because she was short on cash, not to buy illegal narcotics. by CritterFan1 Today at 3:13 pm A bouncing couch???? I read on another blog that Billie gave her couch or loveseat or maybe both away a few days after Hailey went missing.....replaced it/them with her brothers old furniture. Also read that Hailey slept on that couch or loveseat at night. I'm sure LE has checked it all out. Was Billie all gussied up to appear on camera? Or did she look like a "real" grieving mother with no make up and need of a few weeks rest? A woman said she spotted Hailey Dunn the night she disappeared, walking with a friend and a teenage boy, Dunn's mother said today in a news conference. Billie Dunn handed out a timeline (attached below) to reporters, saying she had information that investigators had not previously revealed. According to that timeline, Hailey was seen at 8:30 p.m. on Dec. 27 with the friend whose house she said she was going to spend the night at. The witness didn't recognize the teenage boy who was with them. At last word, authorities stated Shawn Adkins, Billie Dunn's boyfriend, was the last person to see Hailey at 3:15 p.m. She told him she was going to stop by her dad's house, then to spend the night with her friend. According to earlier reports, she never showed up at either location. She was reported missing on Dec. 28. Billie Dunn was considered a "person of interest" in the investigation, but has been ruled out, said Pete Kampfer, spokesperson for the investigation. 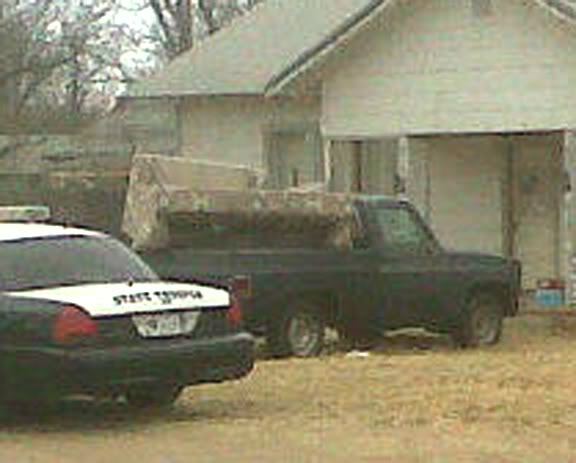 I sure hope LE has checked that couch/loveseat. That is odd to be replacing furniture just a few days after her daughter goes missing. Here's is Billie Dunn's timeline that she released today. I can't copy/paste it and I don't have a scanner so the link is below. That is very damaging, if true, to BD's status of innocence. Why even worry about furniture if your child is missing ?? Home decor would not be on top of my list !! Below is a link to the press conference that Billie Dunn gave today in front of her house. This is raw footage that was shot by someone at the Dunn house and is posted on the 'Help Find Hailey Dunn' Facebook page. I searched the local media sites for this but it's not up yet, I hope it's OK that I put this up for now. Click on the link below, when the FB page comes up, go down to links on the left hand side and click on the press conference. Youtube video up now.......2 comments down. I've not posted on this link much lately because I just didn't know what to think. After watching the above press conference today, I have to say that I still don't think that BD is involved w/ Hailey's disappearance and I don't think she knows what happened to her. I don't see anything wrong with her appearance, she's been criticized for wearing make up and honestly I don't see anything wrong with that, she doesn't seem 'loaded' to me but she sure might be tranquillized. I don't know how much BD has 'partied' in her life, no doubt she's probably done her share but she's lacking a police record so how can any of us really know? Wow raw video. Before edits. I agree raine Billie does not know what happened to Hailey. But I do blame her for what happened. No way would my teen spend the night anywhere with out me talking to their friends parents that night. No way. What was she thinking? I do admire that she did this. Made a press statement. It convinced me beyond a reasonable doubt that she wants to find her daughter and does not know what happened. What is Mark Klass saying about this case? He is a good judge of character so I would be curious as to what he thinks after spending time there with Hailey family. lindamarie wrote: Wow raw video. Before edits. I agree raine Billie does not know what happened to Hailey. But I do blame her for what happened. No way would my teen spend the night anywhere with out me talking to their friends parents that night. No way. What was she thinking? Nor would I LM. I was very careful about where my daughter spent the night, always spoke to the parents and in fact, there were only two places she could stay. BUT, we don't know the circumstances surrounding the Dunn family nor do we really know about this town, I've read where many didn't even lock their doors and that leads me to believe they had a (false) sense of security. I'm not saying it was a wise way to do things, absolutely not. I just can't crucify this Mother for what I believe to be bad judgement. I also thinks she's very guilty of bad judgement moving this guy (SA) in, especially after meeting him on the Internet. I also wonder how BD herself was raised, she might not have even known this was a bad move. I do admire that she did this. Made a press statement. It convinced me beyond a reasonable doubt that she wants to find her daughter and does not know what happened. What is Mark Klass saying about this case? He is a good judge of character so I would be curious as to what he thinks after spending time there with Hailey family. I really want to know what Mark Klass thinks too but I haven't read or heard anything about his thoughts about this family. 12:00PM	Hailey returns home from an overnight Christmas visit with Clint. During this overnight visit, Hailey took off a pair of red hoop earrings, dropped them by the couch, and asked Naomi to put them away. Naomi was able to find only one of the earrings. Although Billie hadn’t seen Hailey since 10:00pm or 11:00pm on the night of Sunday, December 26, she told LE that Hailey was wearing the earrings when she disappeared while Billie was at work on the afternoon of Monday, December 27. Later, after Hailey disappeared, the earring that had been dropped was found at Clint’s home, where Hailey had dropped it on Sunday, December 26, before she returned home. Time assigned to this on Billie’s timeline 1/31. 09:00PM	David sees Hailey playing a video game in the living room or in his room as he leaves the house. Billie changes this time on her timeline 1/31 to 8:00pm to 9:00pm in David’s room. Last reliable sign of life from Hailey. 10:00PM or 11:00PM	Billie sees Hailey watching TV while laying in bed in her room. Billie changes the time again on this on her timeline 1/31 to 10:00pm, and adds in that she said good-night to Hailey. 12:00AM	Hailey estimated to have stopped playing her video game, based on her skill level, and the level at which the game was found. 06:00AM	Shawn arrives at work, and gets a Dr. Pepper. Shawn claims he had an argument and quit or was fired. LE affidavit states that he and his supervisor saw each other, Shawn did not speak to anyone, that Shawn was a good employee, and there was no incident or employment termination. 06:10AM	Shawn leaves work. 6:10am + 36 min = 6:46am. 06:20AM	Billie looks in on Hailey in bed in her room, but is unsure if she’s there. Last time Billie makes an effort to determine Hailey’s whereabouts or well-being until Tuesday, December 28 between noon and 1:00pm. Billie assigns the 6:20am time to this on her timeline, and changes from unsure if Hailey’s in her room, to she saw Hailey and she was sleeping and the TV was on. Billie leaves for work, picked up by co-worker. Billie uses her cell phone, then leaves it home for Hailey and David to use. The phone is supposed to remain at the house. 06:30AM	According to one news article, Shawn drives Billie to work at this time. 06:35AM	Per cell phone pings, Shawn returns to Colorado City. 06:46AM	ETA at Colorado City for Shawn. 6:10am + 36 min = 6:46am. 09:38AM	Per cell phone pings, Shawn arrives in Big Spring. Shawn makes or receives a total of 11 phone calls. His mother and an uncle see him at his mother’s home. 01:00PM	Time Billie originally reported to LE that Shawn came home and saw Hailey. During questioning by LE on December 29, the day after Hailey was reported to LE as missing, Billie and Shawn changed this time to 3:00pm. 01:15PM	Original time Billie reported to LE that Hailey leaves home. Billie and Shawn changed this time to 3:15pm on December 29. 02:00PM	Mary Beth receives text message “what are you doing?” from Billie’s cell phone. 03:00PM	Shawn arrives at Hailey’s home in Colorado City. Hailey is in the living room watching TV, and tells him she is going to her father’s, then to her friend’s, Mary Beth Garcia. Billie originally reported the time of this event to LE as 1:00pm, then she and Shawn changed it to 3:00pm on December 29. 03:15PM	Hailey leaves home, leaving all personal belongings behind. Billie originally reported the time of this event to LE as 1:15pm, then she and Shawn changed it to 3:15pm on December 29. Per LE search warrant affidavit of January 6, no one sees Hailey walk anywhere on this day. Bloodhounds later track Hailey only at a few spots near Western Suites hotel off I-20. 04:00PM	David returns home, pounds on door for 5 minutes, but no one answers, so he enters home through a window. Shawn is standing in a hallway with “a deer in the headlights look.” This time was originally 5:00pm, but changed on the affidavit to 4:00pm. Billie changes this time on her timeline 1/31 to 4:00pm to 5:00. After 04:05PM	At some time between 4:05pm and December 28 at approximately 12:00pm when Billie calls him, David goes to a friend’s house. He is gone from the home “all day” on December 28, but “all day” has not been defined, that is, it is unknown which date and time David went to the friend’s home, only that he is at the friend’s home when Billie calls him around noon or 1:00pm on December 28. This time would have originally been 5:05pm. 05:00PM	Original time David returns home. Time changed per the affidavit to 4:00pm. After 05:05PM	Original time David would have gone in through the window. Time would have changed per the affidavit to 4:05pm. 05:45PM	Original time reported that Shawn picks up Billie at work, although she was supposed to work a 12 hour shift this day. Time later changed to 6:15PM. 06:15PM	New time from Billie’s timeline 1/31 that Shawn picks up Billie at work. Time originally 5:45pm. 06:19PM & 06:20PM	Billie and Shawn make 2 ATM withdrawals in Snyder, $60 and $80. Billie tells LE that the money was to buy illegal narcotics from someone in Scurry County for her and Shawn. Later still, Billie claims to have gotten the money to use for groceries and gas, and that she and Shawn were in Scurry County for only about 15 minutes. 6:20pm + 15 min = 6:35pm + 36 min = 7:11pm. Note that drive time from Billie’s workplace to her mother can not be included in the timeline at this time, as there is no source currently to confirm where Billie works, or where her mother lives. 06:30PM – 6:40PM	Time added in from Billie’s timeline 1/31 that Shawn and Billie went to Billie’s mother’s house. 07:30PM	Billie and Shawn arrive back home in Colorado City. 07:30PM	Billie and Shawn begin watching movies. 9:00PM or 10:00PM or 11:00PM	Billie and Shawn go to bed. Billie changes this to 9:00PM on her timeline 1/31. Per Billie’s press conference 1/31, David came in and said good night soon after 9:00pm. 06:30AM	Shawn drives Billie to work. 07:00AM	Billie arrives at work per her timeline 1/31. 12:00PM or 01:00PM	Billie calls David and tells him to text Mary Beth, and tell her to tell Hailey to come home. First time Billie has checked on Hailey’s whereabouts or well-being since 6:00am on Monday, December 27. David is at a friend’s home. Billie’s cell phone is supposed to be back at Hailey’s home. Note Billie changes this at her press conference on 1/31 to she called him on her cell phone she had left at home. David is unable to contact Mary Beth by text, and so phones. Mary Beth says Hailey never said she was going there, and never came over. Billie has a co-worker or her sister-in-law drive her to Colorado City. She stops at home first to see if Hailey has come home. Shawn meets her at home. Shawn appears very upset and shaken. Billie goes to two of Hailey’s friends’ homes. David goes to Clint’s home and asks if he’s seen Hailey that day, which Clint hasn’t. David tells Clint that everyone is starting to get worried about Hailey. It is unknown if David went home before going to Clint’s house, or if he went directly from his friend’s home to Clint’s home. Billie then rides to the police department and reports Hailey missing. Unknown who drove Billie, and who all, if anyone, went with her. Billie changes this time again to 12:00PM on her timeline 1/31. After 12:00PM	At some unknown time after arriving home, but still on this day, Billie calls all her close family members, and all Hailey’s friends. 02:00PM	Billie arrives at the police department and reports Hailey missing. Note: 2:00pm – 36 min = 1:24pm. Billie spent somewhere between 24 minutes and an hour and 24 minutes checking places for Hailey before going to LE to report her missing. Colorado City Manager Pete Kampfer confirmed Monday Billie Dunn has been ruled out as a person of interest in her daughter's disappearance. 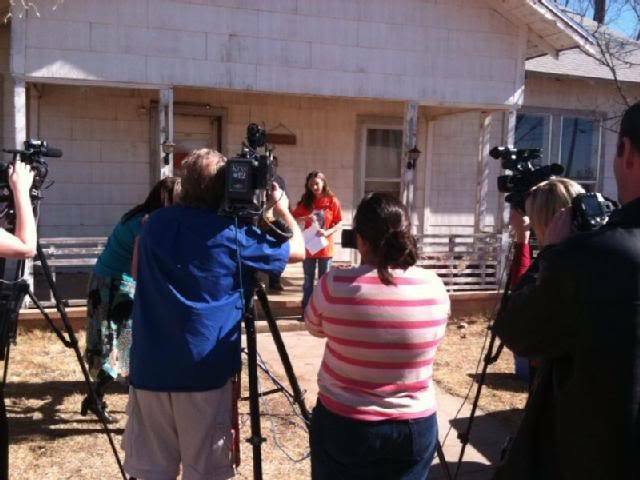 Billie held a media press conference outside her home in Colorado City Monday where she read a timeline of events directly before and after Hailey vanished late last month. The timeline covers from noon on December 26 up until 3 p.m. on the 28th, when Billie reported Hailey missing. "I was kind of upset that Hailey hadn't called me...Shawn did let me know she was staying the night with her friend," she said. Dunn said she is disappointed with the way law enforcement has handled the investigation. "I do not understand why they seemed to have disregarded all of the witnesses who have come forward to say they saw Hailey. I also don't understand law enforcement's reluctance to publicly name any other persons of interest," she said. Kampfer said he will not comment on persons of interest other than Shawn Adkins as not to jeopardize the investigation. "We don't want to tip our hats to anything," he said. Kampfer says police are working nonstop on the investigation, following up on leads, putting up billboards, and searching areas around Colorado City. "Our officers have been working around the clock. We're still working and building a criminal investigation and that's basically where we're spending most of our time at," he said. Still five weeks into the investigation, Billie continues to hope Hailey will walk through the front door. "There's not a minute that goes by that I'm not praying for you or crying, wishing you were in my living room," she said. Billie's timeline also includes a neighbor that said she saw Hailey at 8:30 p.m. on December 27. Kampfer said investigators have not been able to confirm the sighting. Citing "ridiculous" accusations, the mother of missing Colorado City girl Hailey Dunn called a news conference Monday to clarify details surrounding the disappearance of her daughter. Speaking to reporters in front of her home, Billie Jean Dunn read a prepared statement and provided copies of a timeline that she said provided information that was not being relayed by law enforcement. Billie Jean Dunn said she felt compelled to make the statement to defend herself from "ridiculous accusations and slander" as a result of her words being misrepresented in the media. Interviews she has conducted have been edited, she said, and by not having them presented in their entirety, some things have been taken out of context. She began the statement by speaking directly to Hailey, in case her daughter was able to hear her, letting Hailey know that hundreds of people are searching for her and would not give up hope. She also addressed an alleged abductor, asking the person to let Hailey go — or to drop her off at a hospital or police station. Addressing the days leading up to Hailey's disappearance, Billie Jean Dunn said there had not been an argument on Christmas morning, as previously had been reported, and called the claims that she and then-boyfriend Shawn Adkins, the only named suspect in the case, had hosted a New Year's Eve party three days after reporting the teen missing an "absurdity." Billie Jean Dunn also expressed frustration with law enforcement's handling of the case. She indicated that officials were disregarding witness statements that indicated Hailey, 13, had been seen as late as 8:30 p.m. Dec. 27. She also criticized investigators' reluctance to identify other people of interest in the case. By not bringing in anyone and everyone who might have knowledge of Hailey's whereabouts, Billie Jean Dunn said, police were being negligent. Pete Kampfer, Colorado City's city manager who has been working as the liaison between law enforcement and the media, said law enforcement agencies have been working diligently on the case since the beginning. "To say we are being negligent would not be appropriate. We are working hard, following everything, every lead, to the last degree," Kampfer said. Kampfer said that police are aware of the witnesses' accounts but that law enforcement has not been able to corroborate them. Regarding the naming of other people of interest, Kampfer said officials are following several leads, including two leads involving people. But, Kampfer said, identifying the other people whom investigators are looking into might result in those people fleeing or tampering with evidence. He said fear of potential retribution against the family by those named is a concern, as is the possibility someone might do something to harm Hailey or destroy evidence if they knew police were focusing on them. When naming Adkins as a suspect, Kampfer said, law enforcement was aware of the potential risks. Sometimes, he added, watching how someone responds psychologically to being named a suspect can be very telling, and potentially could lead investigators to new evidence. Kampfer also said that although it may appear that not much progress is being made in the case, there is a lot of "old-fashioned police work" being done. Law enforcement officials searched all weekend in Scurry County, scouring abandoned buildings and eliminating a lot of suspicious areas, he said. "Eliminating possible locations and possible suspects is a big part of what we do," Kampfer said. Kampfer said Hailey's family may not be aware of everything being done in the case because law enforcement tries to keep "intelligence going backward." During the news conference, Billie Jean Dunn indicated that she would not be taking questions, but she did answer one. When asked to characterize her relationship with Adkins, Billie Jean Dunn replied, "We're friendly. We talk on the phone." Also during the event, Billie Jean Dunn thanked the Laura Recovery Center for Missing Children and the KlaasKids Foundation, along with all of those who have volunteered to search for her daughter. She also thanked Diena Thompson of the Somer Thompson Foundation for a grant Billie Jean Dunn recently received. Billie Jean Dunn said that although she has never asked for money, she is thankful to those who have donated to her. She also alluded to some who may be seeking to profit from Hailey's disappearance by soliciting donations. Previously, Clint Dunn, Hailey's father, has said that he is unemployed and that he will continue searching for Hailey as long as people keep donating money to help him cover his expenses. As the investigation into Hailey's disappearance continues, officials in Howard County recovered some clothes during a search over the weekend. "The Colorado City police do have something in custody, some clothing, I believe. Possibly some socks. It is still being analyzed. We are not sure if it is related to this case," Kampfer said. Kampfer said the investigation continues to be focused on search, not recovery. "At this point we're still looking for her alive — until we believe there's reason to be looking for a dead body," he said. Volunteer groups continue to search for Hailey in Colorado City and the surrounding areas. Billie Dunn, the mother of missing teenager Hailey Dunn, held a press conference in Colorado City, Texas on January 31, 2011 and released a timeline of events she hopes will be helpful in bringing Hailey home. The 13 year old cheerleader was reported missing on December 28, 2010. 12:00pm: Hailey arrives home after spending the night with Clint. 8:00pm - 9:00pm: Hailey is playing X-Box in David's room. David leaves to spend the night with a friend. 10:00pm: Hailey is watching TV in her room. Billie tells her goodnight and goes to bed. 5:30am: Shawn leaves for work, using Billie's car. 6:00am: Shawn arrives at work. went to his grandmother's house in Dunn, but because no one was home, he decided to go to his mother's house in Big Spring. Shawn further claims that he went directly to his mother's house from Dunn, only coming into Colorado City to access I-20. 6:20am: Billie sees Hailey asleep in her room with the TV on. 6:30am: Billie leaves for work, getting a ride from a coworker. 7:00am: Billie arrives at work. 7:30 - 8:00am: Shawn says he arrives at his mom's house. 10:30 - 1:00pm: A neighbor sees Hailey walking away from her house and then back towards her house. A young boy is with her. 12:00pm: A neighbor sees Hailey in the back yard talking on the phone. 3:15pm: Hailey leaves home to go to Clint's house and then to spend the night with friend. 4:00pm - 5:00pm: David and his friend arrive at home. The friend stays and spends night. 6:15pm: Shawn picks Billie up from work. 6:20pm: Shawn and Billie make withdrawal from an ATM. 6:30 - 6:40pm: Shawn and Billie arrive at Billie's mom's house. 7:30pm: Shawn and Billie arrive home. 8:30pm : A woman sees Hailey, the friend she said she was spending the night with and a teenage boy who is unknown to her walking on Hickory Street in front of Alco. 9:00pm: Shawn and Billie go to bed. 6:30am: Shawn and Billie leave the house. 12:00pm: Billie calls David, who is home. David tells her that Hailey is not back yet. Billie tells him to text her friend and have Hailey came home. The friend says Hailey did not come over. David calls Billie back and relays this information. Billie tells him go to Clint's house to see if Hailey was there. Naomi tells David that Hailey came over on Monday, but did not stay there. Billie talks to Clint, and tells him that she is leaving work to come to Colorado City and report Hailey missing. Billie calls her sister-in-law to pick her up from work and take her to Colorado City. She goes home and to several of Hailey's friends' houses to see if she can find Hailey. 2:00pm: Billie goes to the police station to report Halley missing. Thanks, BJ for providing all this info! I agree with LM & Raine regarding BD's press conference. She does seem to be honestly sharing her recollections of Hailey's last days with them. As for as her lack of emotion, she did show some when talking about Hailey. As far as I know, the timeline is the same as LE's... is this correct? The one big "red flag" that I noticed with her timeline (which also has been reported by LE) is why SA only went into work for 10 mins on Dec. 27th - the last day Hailey was allegedly seen. He says he quit his job or was fired, however, his supervisor says he wasn't. I don't think BD's speech caused me to think differently about SA. I still see SA as the only suspect, but am open to hearing about other ones. The main thing that we all can agree on, is that Hailey needs to be found soon!! I want to thank BJ and Raine for bringing all the details of the infamous press conference yesterday. You both did an excellent job!! I am in complete agreement. However, I personally thought BD's emotions were "flat". Maybe that is just the way she is. I will say this: to be "friendly" and chatting on the phone with the sole suspect in this case speaks Volumes to me. What kind of mother would do that when their daughter is missing? LM also made an excellent point. You don't just let your daughter spend the night with someone you don't know and not even follow it up w/a phone call. Therefore, I see these 3 things as the problem w/BD. 1) Allowing a man she met online move into her home and at times, leaving Hailey and the man (SA) alone. 2) Not calling or going over to the home where Hailey said she was spending the night to make sure she is okay, and meeting the mother. 3) Being "friendly" with SA now and having telephone conversations. Hailey had her own room so why did she sleep on the couch/loveseat? Could it be because she felt safer in the central part of the house when asleep as far as being able to call out or someone entering her room - like SA? Here's what Billie had to say about the couch, but it still doesn't answer your question, Artgal. This is from WS. BILLIE DUNN: No. Like I said, in the beginning, three years ago, she was very upset her dad and I broke up, but I don`t think Hailey feared Sean in the least. And she wouldn`t have been afraid to come to me. She knows that she was number one, her and David are number one. And I don`t think she would have been afraid to come to me. And she didn`t sleep in her room until about a week ago. She slept in the living room on the couch. I think Clint`s mom is just upset. She wants someone to blame also, and that`s understandable. But I really believe Hailey would have come to me or her father. And I don`t think she was afraid of Shawn. So Hailey was number 1 with Billie - so number one that she didnt even check on her daughter or call in the evening to say goodnight or just check on where she would be spending the night and with who. SA was number 1 with Billie not her kids and I still dont believe anything she says. There was a reason that Hailey slept on that couch and not in her room and Billie either knows the reason or if she really doesnt then she never bothered to ask. Does anyone know what BD did with the couch/loveseat that she moved out of residence a few days after Hailey went missing? I've heard that Shawn took the furniture..... and also that a stranger asked if she could have the furniture after a few days of sitting in the truck in the yard. Billie's brother gave her his old couch and love seat, I believe. Do you know if LE was interested in the furniture? It seems odd BD would be interested in changing only a few days after her daughter went missing. I agree; especially if Hailey was sleeping on the couch. Everything I've read about the furniture has been on blogs. I don't think I've seen the news media report on it or anything from LE. The sofa went and ones her brother gave her arrived. Her old ones were to go to the dump but some lady driving by asked if she could have them. Could have been LE for all we know??? That would have been a smart move. I thought that was a lot of changing things around when a daughter was missing. Newer sofas for Billie and a new address for Clint. I don't think Billie lives in Texas. I think Billie lives in the state of denial. SA came first and still does. Her son is living with his uncle and I see no plea from Billie to have people calm down so the boy can be returned to his home. If my daughter was missing and they took my boy I would be pleading for whatever I had to do to get my son home with me. SA will be in her bed before DD is home in his own bed. This was posted in response to the questions about the couches. It is from WS and is by Billies friend. I would like to clear something up about the couches. Billie's brother bought new couches, and gave her his old ones. Billie's old ones got stuck in the back of that broken down truck in her front yard for lack of anywhere else to put them. The couches sat there for 2 or 3 days, and then a woman came by and asked if she could have them. Billie said yes, and the woman had a couple of guys pick them up for her. LE had ample opportunity to look at Billie's old couches before she got different ones, and because they sat in the front of the house, in sight of anyone, LE included, it seems to me (JMO) that LE would have hustled on over and taken the couches themselves if they thought there was anything in or on the couches that might be related to anything. I am quite sure that LE can track down the woman who took the couches if they are so inclined. But there is nothing nefarious about Billie getting different couches. Not trying to upset anyone, and discount me if you like. I just really hate that everyone is getting hung up on this. I realize that you all like to sleuth everything though, and this is one thing that I personally know what happened, and am not taking anyone else's word on. jeanne1807 wrote: I don't think Billie lives in Texas. I think Billie lives in the state of denial.. . SA will be in her bed before DD is home in his own bed.